We've seen some really very creative "busvertising" but I think this Dec. 2009 effort gets the palm—by Denmark's Bates Y&R agency for the Copenhagen Zoo, from Coloribus via Andrew Sullivan. The Creative Director was Ib Borup and Peder Schack was the A.D. I think I know people who wouldn't get on this bus. Original contents copyright 2012 by Michael C. Johnston and/or the bylined author. All Rights Reserved. Featured Comment by Rick Bennett: "You can count me amongst people who wouldn't get on that bus. Well, maybe if I was in a tight squeeze." Featured Comment by Eolake Stobblehouse: "As a Dane, I can tell that Copenhagen has a nice tradition for bus art. Years ago they had a series of busses which were not even commercial, but were painted by commissioned fine arts painters, some were great." Who wouldn't get on this bus ? Indiana Jones in Raiders of the Lost Ark - "...Snakes...why did it have to be snakes..."
Nelville Flynn (Samuel L Jackson) - Snakes on a Plane: "...Everybody listen up! We have to put a barrier between us and the snakes !..." It advertises the Wrocław ZOO. I saw a picture of an articulated bus yesterday. 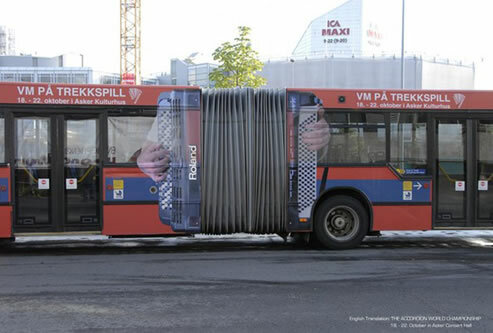 The two parts of an accordian had been painted either side of the flexible joint of the bus. The painted "indentations" really did look quite convincing - even up close. You know when some things just make you grin..... this is one of them! Hats off to the people who designed and implemented it :) This kind of visual humour transcends all boundaries of age and culture... unless your culture believes some kind of omnipotent snake-god I guess! You are right. My wife had one look and said "I wouldn't get on this bus!" I wonder if it's not a little scary for foreign drivers, you take a turn and suddenly you have the snake head in your car window, who knows, it looks very realistic. I really hate snakes and I also probably wouldn't get on that bus - hopefully the next bus has a different paint scheme. It is quite good though, hence all the anti-snake vitriol (I wanted to say venom, but that just wouldn't be right). I hope the photo was taken with lossless compression! Technology does not necessarily make a talented artist. Anyone can purchase a huge format printer, computer and sign layout software to make any type of signage but only those who have a high level of talent and skill in the trade can create stunning signs. What a clever ad! A few years ago the Shedd Aquarium created an entrance shelter that looked like a giant anaconda was eating the line of visitors. It was pretty cool, too. Much more interesting than the advertising clad busses we get here. I like the Pabst beer art on the buses in Milwaukee. Pretty hip. gotta be hell on schizophrenics . . . .
Actually, I'm kidding. I LIKE the bus, and wouldn't have any problem with it. It's the realistic closeups that get me. National Geographic used to do that, from time to time. Really, I don't hate them. I get that they are God's creatures, and like all other animals, a complex and beautiful response to evolutionary pressures. But so are bedbugs and mosquitoes. And Escherichia coli. I liked the "sharkbus" I saw in Auckland last year. This is rather creative, but will not appreciate the people should be scared. Want to be on one actually. How many time you can enjoy your bus ride by looking outside for the reactions of people looking at you! A question for TOP readers in Denmark: Just curious, why do you think the writing on the side of the bus is in English, not Danish? 1. It's Copenhagen and I suspect they're targeting tourists so the international language is English. 2. Most Danes speak English. I'm not a Dane but I lived in Aarhus for half a year and spoke very little Danish. Even the teenage checkout girls at the supermarket could switch from Danish to perfect English when presented with a very confused English guy. As a Danish friend of mine said when I asked him why so many Danes speak excellent English (and German and can get by with Norwegian (roughly same written language but spoken like Scots is to English) and Swedish): "There are only 5 million Danes. You can't expect everyone to learn Danish". Only the tagline would be incomprehensible to non-English speaking Danes. Zoo is the same in both languages. That and the snake. They would get the message. ** "Why English on the Danish bus?" but you got that from context and a couple of similar words (from Google translate as my Danish is now non-existant apart from tak and an understanding of Hyggelig).